I used to use leather labels for the bags when I first started Modern Coup, about 2.5 years ago (see here). They were beautiful, but very difficult to attach onto the lining of the bag due to its thickness. After a while, I started using a fabric ink stamp. Well, this year, I decided to bring leather labels back. What’s the difference now? 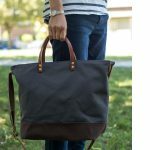 I’m using a lighter weight or thinner vegetable tanned leather. What I used to use was too thick for the labels and so it was difficult to stitch through. I had this solid brass stamp made for Modern Coup when I first started this micro-business. It’s such a beautiful stamp and I wanted the bags to each have this label on it. This is the only part of the bag that I hand-stitch, but it’s worth the extra time. 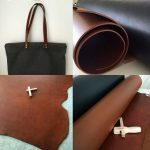 This leather is a natural or naked colour vegetable tanned leather. What’s interesting about this leather is that the colour darkens with age. It can turn into a cognac colour or even dark brown. I’m going to do a before and after to show you the colour difference another time. Modern Coup Studio: Ever Worked With a 2-Year Old? Bridle Leather Shipment Has Arrived! 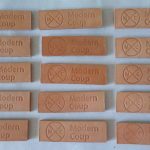 Visit Modern Coup's profile on Pinterest.